The best part is quinoa tastes great and it’s a natural anti-inflammatory gluten free food! It’s also very rich in iron, calcium, copper, and potassium. Many believe it could even help prevent type 2 diabetes, childhood asthma, heart diseases, gallstones and migraines. Since most grains contain gluten and are very high on the glycemic index (Major premature aging factors! ), substituting with this amazingly healthy, great tasting grain could make a big difference in how you look and feel! Quinoa is a good source of insoluble fiber known to help prevent gallstones, especially in women. It has a very low content of saturated fats and cholesterol, making it an ideal food for every health conscious consumer. It has a very high content of manganese, which acts as a powerful antioxidant in the body. Some believe manganese helps kill cancer cells! It’s a good source of magnesium, which is believed to help provide relief from migraine headaches, relaxes blood vessels, and decreases the risk of hypertension. It’s a perfect source of fiber which is important for a healthy colon. It has riboflavin which is believed to reduce the frequency of migraine attacks, by producing energy metabolism within brain and muscle cells. It’s a great source of potassium which is needed for proper cardiovascular function. It’s a great source of calcium, which is important for healthy teeth and bones. Since it is gluten free it’s great for people who are allergic to wheat or that have Celiac disease. It’s an efficient fuel for energy production in the body. Its high copper content is great for helping to metabolize glucose – Also helps produce the skin coloring agent melanin and assists in the formation of hemoglobin. Lignans Like Those Found In Quinoa are Powerful Defenders Against Heart Disease! A phytonutrient found abundantly in quinoa and certain other grains are plant lignans, which are converted by friendly flora in our intestines into mammalian lignans, including one called enterolactone that is thought to protect against breast and other hormone-dependent cancers as well as heart disease. When blood levels of enterolactone were measured in over 800 postmenopausal women in a Danish study published in the Journal of Nutrition, women eating the most whole grains were found to have significantly higher blood levels of this protective lignan. Quinoa is loaded with magnesium, a mineral that acts as a co-factor for more than 300 different enzymes, including those involved in the body’s regulations of glucose and insulin secretion. Research suggests that regular consumption of whole grains like quinoa also helps reduces risk of type 2 diabetes. (van Dam RM, Hu FB, Diabetes Care). An 8-year trial, involving 41,186 participants of the Black Women’s Health Study, research data confirmed inverse associations between magnesium, calcium and major food sources in relation to type 2 diabetes that had already been reported in predominantly white populations. Risk of type 2 diabetes was 31% lower in black women who frequently ate whole grains similar to quinoa compared to those eating the least of these magnesium-rich foods. When the women’s dietary intake of magnesium intake was considered by itself, beneficial, but lesser—19%—reduction in risk of type 2 diabetes was found, indicating that whole grains like quinoa offer special benefits in promoting healthy blood sugar control. Research reported at the American Institute for Cancer Research (AICR) International Conference on Food, Nutrition and Cancer, by Rui Hai Liu, M.D., Ph.D., and his colleagues at Cornell University shows that whole grains, such as quinoa, contain many powerful phytonutrients whose disease fighting and antioxidant activity has gone unrecognized until recently because research methods had previously overlooked them. Many think of quinoa as a grain, but it’s actually a seed that comes from a plant named Chenopodium quinoareflects and it’s a member of the spinach, chard and beets family. These healthy seeds are rich in amino acids and are highly nutritious and incredibly delicious. When cooked quinoa seeds are fluffy and creamy but also have a slight crunchy texture and nutty flavor. There are several types of quinoa and the most popular type is the yellow color. Other varieties come in colors such as orange, pink, red, purple or black. 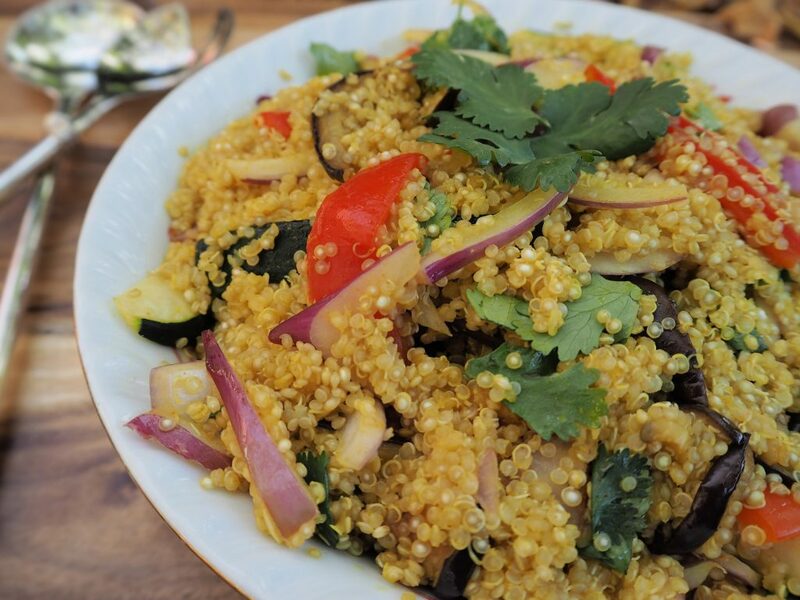 Try substituting quinoa for rice, pasta or bread whenever possible. You can spice it up as you would any other dish. We believe this one step in itself could quickly make a major difference in your energy levels and how you look and feel! Quinoa can be found at most Health Food Outlets such as Whole Foods, Earth Fair, Sprouts, etc. Scramble two eggs, preferably in coconut or sesame oil. Chop the eggs up and mix them in a bowel of Quinoa along with several tablespoons (or more depending on your taste preference) of your favorite salsa and serve. Ketchup and tabasco also works well. Yummy! Djoussé L, Gaziano JM. Breakfast cereals and risk of heart failure in the physicians’ health study I. Arch Intern Med. 2007 Oct 22;167(19):2080-5. 2007. PMID:17954802.